Teleconferences are a great way to connect to people around the world. They’re less expensive than face-to-face meetings, often take less time, and solve problems more efficiently than emails do. Conducting a teleconference should be easy. All you have to do is connect everyone on the phone and make decisions as if you were all in person, right? Unfortunately, it’s not that easy. A teleconference is not your average phone call. It is a meeting and needs to be prepared for as such. Below are some key points to help you remember that a teleconference isn’t your typical phone call. Teleconferences aren’t difficult to carry out, but many people are not mentally prepared when joining. Having the awareness, through the 3 main points below, that your telecon is not just a normal call is a great start. 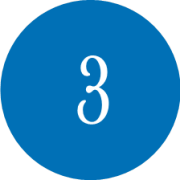 Send out an agenda beforehand with objectives, time(length) of call, participants, and specific results you want to achieve. Identify roles: moderator, minute taker, etc. Remember, ideally the moderator and minute taker will be two separate people. Also, just because someone sent out the Outlook invitation, doesn’t mean they are automatically the moderator. Make it clear before the call. The moderator should also open and close the call in an official way. Open: state the objectives and goals and introduce people if needed. Close: review the action items identified and what the next steps are. The moderator should make an effort to include everyone on the call as best they can with pointed, open questions directed at specific people. This will encourage and facilitate participation. You might enjoy reading Chad Phillip’s post: Teleconference tips and phrases. 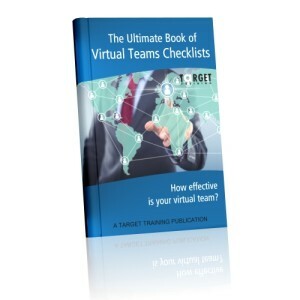 The simple and practical checklists in our latest Ebook: The ultimate book of virtual teams checklists may also be of interest to you. How effective is your virtual team? From a business perspective, teleconferencing makes a lot of sense: with a simple set-up, a company can host a meeting with employees, customers and suppliers from around the world at very low cost. However, the flip side is that teleconferences present significant challenges to participants for several reasons. Most companies still use audio-only conferencing, which means there are no visual clues to help us understand each other. On top of that, the call quality can sometimes be very poor. We also have to consider the fact that teleconferences can involve people from many different levels of English proficiency. All of these factors make teleconferences an efficient, but sometimes stressful, way to exchange information. Here are some teleconference tips and phrases that might help you feel more comfortable during your next call. Get familiar with the equipment. If you are responsible for the meeting, learn how to use the teleconference equipment before the meeting. If you have technical problems,, they will be easier to solve, which will save everyone time. Do a roll call. Take a moment at the beginning of the teleconference to allow everyone to identify themselves. This will let you know who is involved, but can also serve as a technical check: if someone is too loud or too soft, the problem can be addressed now. Also, make a note of the names and use them later to identify participants. Have an agenda and refer to it often. An agenda is a good idea for most meetings, and teleconferences are no exception. Frequent reference to the agenda can be a good tool for making sure participants keep their attention focused on the meeting and not on their text messages or emails. 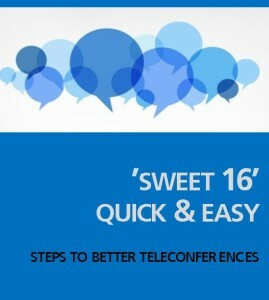 Using the tips and phrases above can help your teleconference run more smoothly. Do you have any ideas you could add to our list? If so, let us know in the comments section below. Also, see how you can further improve your teleconference skills by clicking here.